Regulate the number of children at the sand table based on the ability of the children playing to tolerate jostling and distractions. The height of the sand table should be adjustable, so children can play in an upright position with both hands able to reach the sand. 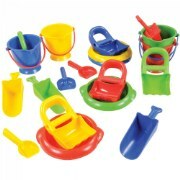 Provide sand toys at the child's current level of skill, and then gradually introduce more advanced play skills. Put out a few pieces of sand accessories; rotate with new equipment from time to time. 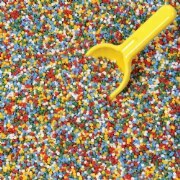 If the sand is too overstimulating, replace it with a heavier material such as small pebbles, although these might be a choking hazard if the children are not carefully supervised. Place basins of sand in the sand table if children are having difficulty staying in their own space. Basins of sand can also be placed on a child's wheelchair tray if the chair is unable to fit under the sand table. Encourage children to use language skills when playing in the sand. 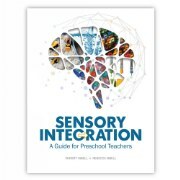 Supplement verbal directions with demonstrations and picture symbols when instructing children with language delays in the use of water toys. Observe the child to determine if the level of stimulation at the water table is comfortable. If the child is focused on the water play and interacting with the other children, the amount of stimulation is probably at the optimal level. Introduce novel water toys when the child's attention begins to fade. 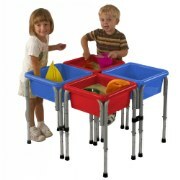 Provide turkey basters and eyedroppers in the water table to work on hand skills. Place the water table in a well-lighted area of the room that is not visually distracting for the child. 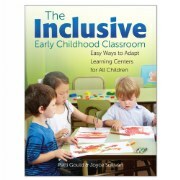 For more information on how you can help children with special needs succeed in the classroom, visit the Inclusive Classroom category in our Insights and Inspirations section. You can also browse our Sand and Water section to see the variety of sand and water tables and accessories we offer.